When Winter, an Atlantic bottlenose dolphin, was found trapped with her tail badly damaged, she was not expected to survive. This is her miraculous story, from her rescue to learning how to swim again to her unprecedented success using a prosthetic tail. 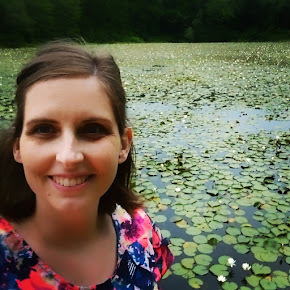 This is also a celebration of her indomitable spirit. Winter's Tail: How One Little Dolphin Learned to Swim Again is a sweet, nonfiction read that's perfect for kids who love sea animals or who may themselves be facing a difficult challenge and need a little inspiration. Winter's story is universally appealing, and the book itself is well-constructed with beautiful photographs of the dolphin's adventures, beginning when she was found by a fisherman tangled in a trap line. While I would've often liked more details (it's a cool story!---I wanted to know more about the specifics of it all), perhaps the generalities will inspire kids to get on the Internet or go to the library to learn more---more about how Winter's trainer taught her to move her tail up and down instead of side to side, more about how the prosthetics expert developed a tail that could mimic a real dolphin's, more about how Winter swims now that she's trained with her new tail for a long time. 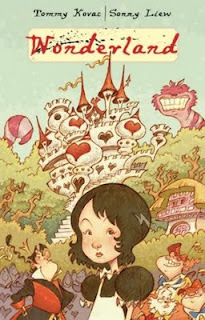 Any book that inspires kids to do better or learn more is a great book indeed. Thumbs up for Winter's Tail. And in case the list isn't tantalizing enough, here's a picture of the prizes. You have two weeks from today to comment on this post (deadline being November 10, 11:59 p.m.). One comment per person, please. And please be sure to include your e-mail address so that we can contact you if you've won. Tell your friends and fam about this giveaway too---we think it's pretty cool! If that's not enough Winter excitement for you, Scholastic is also holding an essay contest for young readers ages 6-14. Check out the details below if you're interested. Scholastic wants to hear about an animal that has most inspired your children by having them tell us about their favorite animal hero in 200 words or less. One grand prize winner and his/her guardian will receive a trip to visit Winter at her home in Clearwater, Florida, one night's stay at a hotel, $500 travel voucher, a Winter prize pack and a Nintendo DS Game system! 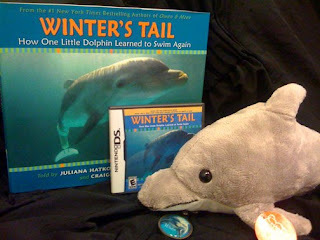 10 runners up with receive a copy of Winter's Tail, a Winter's Tail Nintendo DS game and a Winter plush doll! Each entry must include student's name, age, and grade; teacher's name; and school name, address, and phone number. All entries must be received by November 30, 2009. Winners will be announced on or around December 14th. No purchase necessary. Open to legal residences of 50 United States and D.C. ages 6-14 as of November 30th 2009. Void where prohibited. Click here for complete contest rules. Or go here for the PDF. I recently received a copy of this book from its publisher to review on Everead. So here goes. I am not a five-year-old boy. So it wasn't my favorite. 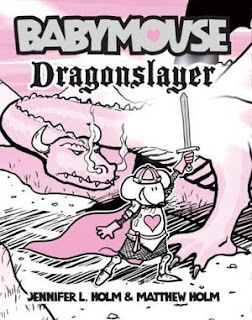 But if you are a five-year-old boy, you just might like this book. Colonel Trash Truck is a save-the-day garbage-crushing hero who's helping to clean the world, one piece of trash at a time. The book is meant to inspire kids to "think green" and not litter. The book is written in rhyme, which occasionally feels forced, particularly the page about cleaning up your "boogies" and "loogies" and not picking your nose. I had a hard time seeing the connection between nose-picking and garbage trucks---technically, using a tissue actually creates more trash, right? 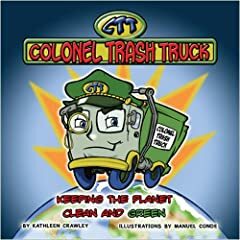 In any case, if you've got a young kid, likely male, who really likes garbage trucks and likes to think about the environment, this could be a fun book for him. That's my take. Oh, I had so much fun reading the first two Lunch Lady books by Jarrett J Krosoczka. They are just too funny! And the crime fighting is top notch. The first one is Lunch Lady and the Cyborg Substitute. The second, Lunch Lady and the League of Librarians. Does white count? Anyway. The use of the color was so skillful! It really draws your eye to the important parts of the panel and aids in the visual read. There are so many different shades of yellow, you know? I would even go so far as to say that Krosoczka evokes mood with his use of the color. Very nice. If I didn't already have my costume all planned, I'd totally be Lunch Lady for Halloween. Next year, next year.